This 18 inch office vacuum by Powr-Flite is great for vacuuming the largest areas of carpeting. It is the most powerful vacuum we have to offer, so it quickly cleans carpeting in hotels, offices, and restaurants. Not only does the Powr-Flite PF18 clean wide open areas like in offices, quickly and efficiently, but it also has a full complement of tools to clean up against edges and other hard to reach areas. 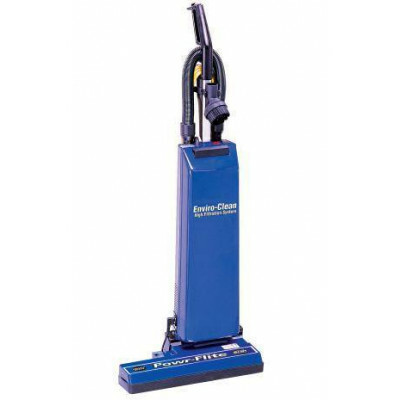 If you are looking for a smaller version of this model, we do have a 14 inch commercial vacuum cleaner model available, at a more economical price. We do also have a full complement of dual motor commercial vacuums available, if this is not the model you're looking for. 50' detachable power cord with plugs on both ends, yellow. Full bag light alerts you as to when to change your disposable paper bag. Rotating cord hooks means no need to unwind the power cord for use. Stretch hose has identical cuffs allowing you to change directions for easy clean out of clogs in the hose. Electronic Indicators: Bag full, belt breakage, brush pressure, brush roll blockage, airway blockage. Customers who were interested in the Powr-Flite® Enviro-Clean 18" Office Dual Motor Vacuum Cleaner were also interested in the following items. This is a review for the Powr-Flite® Enviro-Clean 18" Office Dual Motor Vacuum Cleaner.